Engelberg is a true winter wonderland with the season lasting from October until May. With 14 winter walking trails, 30km of cross-country trails, snow bikes and snowmobiles at SnowXPark, and the fun Titlis Glacier Park there is something for everyone. The resort has two separate ski areas. Titlis is perfect for intermediates while competent skiers will find many off-piste areas easily accessible from the lifts. Beginners will be happier in the Brunni area on the opposite side of the valley, which also offers night skiing every Friday until 9pm. The resort has over 80km of pistes in total with the longest measuring 12km and taking in 2,000m of descent. Even non-skiers must take the revolving Rotair Titlis gondola over the glacier for the fantastic views. Some of the pistes are covered with snow making production which helps add to the natural snowfall for more guaranteed skiing throughout the course of the winter season. Children’s facilities are excellent and for those who have had enough of their skis, they can always slide down the fantastic 3.5km toboggan run or use rubber tubes on the “Wet’n Wild” snow amusement park. Other attractions in Engelberg include a 25m indoor swimming pool, and the famous revolving cable car. There are some excellent bars and pubs, some with live music; the infamous Yucatan Music Bar, the Eden Bar, the Spindle and Terrasse. There is also a wide variety of restaurants to choose from. 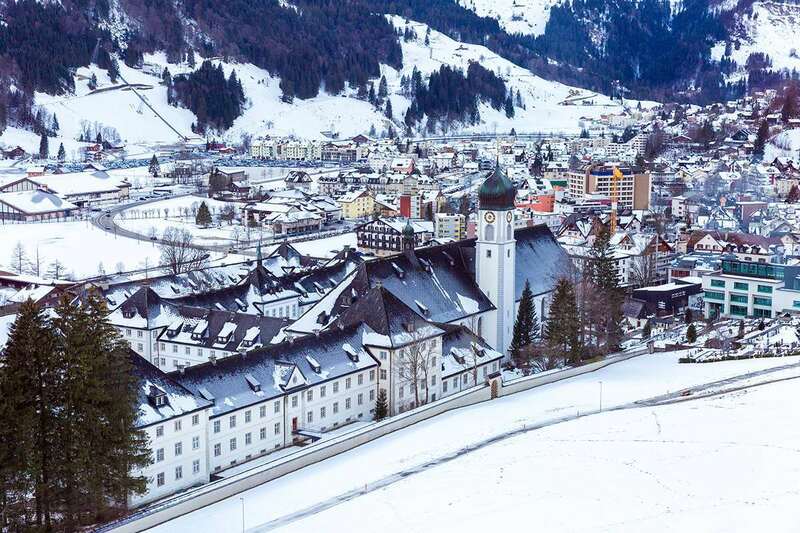 Located in the centre of Switzerland the Engelberg ski resort is only an hour and a half from Zürich so makes an easy destination for a long weekend. The nearest international airport is Zurich which is 20 km from the nearest motorway accessible via a short car or bus transfer.